September » 2007 » Harrumph! 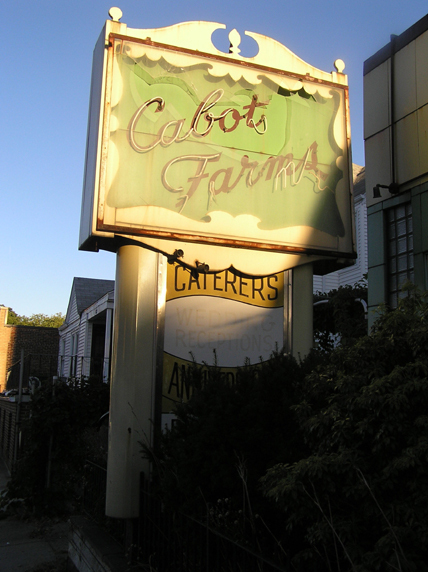 First it was Ashmont, which was far too overpriced to attract buyers, and now let us consider Cabot Farms, apparently locked in some mysterious post-mortem struggle. Pix: Click on an image for a little larger version. Those of us on the southern side of Boston — JP, HP and Rozzie, not Southie — have oldster moments ruing the closing of Ashmont. Not only was that nowhere near Ashmont, but it was a portmanteau of oddments. Sure, there were construction supplies in the back, but that’s not what people came for. There was no need to head to the ‘burbs for a vacuum-cleaner bag. No matter how outdated or unusual your little sucker was, Ashmont had that bag. Likewise, it still carried the glass door knob sets, and if you had lights that used the big clear screw-in bulbs usually available only during Christmas, Ashmont had those all year. Hardware, housewares, electronics…whatever. That looks like it will become a Staples. Yawn. Apparently the owners finally relented a bit on their outrageous price, enough for a rich chain to buy in. The entirely forgettable replacement brings Natick right into Beantown. About 10 miles north-ish in Somerville on the Medford line, another long abandoned business on another busy main drag looks to remain empty, despite eager customers. The Cabot Farms/On Broadway/Garden thingummy has become the stuff of whispered tales in Powderhouse Square. The view from 880 Broadway is through dirty glass. The view into it is of barstools which haven’t felt the weight of relaxed drunks for decades. The skeletal marquee frame presages horrors that apparently have never happened there. 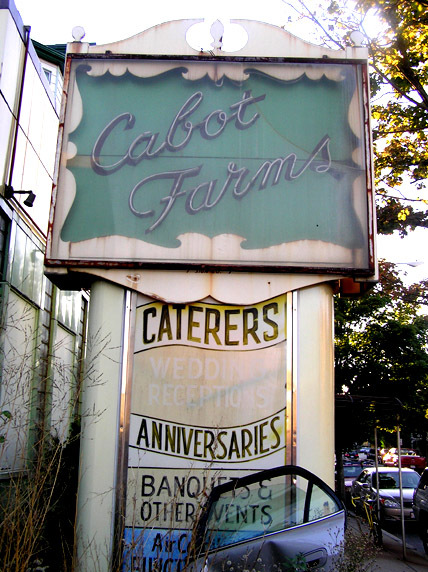 The major Cabot Farms sign is replete with heavy undergrowth and its very own car door at the base. The front is mostly what I insist on calling VFW brick — those glass blocks so popular at men’s clubs when the old guys gather to drink from the morning as heavily diffused light shields them from the world. There is an abandoned function hall, The Garden at the other end, which apparently got a little use for wedding receptions and such a decade or so ago. The middle has a small, still used apartment set, which must generate enough income for building expenses. The northern side that was Cabot Farms catering and restaurant and then briefly in the 1980s, On Broadway nightclub, is the time capsule, apparently sealed for the past 20 years. The building front has large poster-style musicians, Satchmo and Sinatra, with the implications of nightlife and vitality far more intense the Tufts area reputation. On the outside of the inner door glass is a sign reading, “PRIVATE PARTY PLEASE NO SMOKING INSIDE THE PREMISES.” That very late 20th Century attitude belies the best legends about 880. There are whispered tales of politicians, mobsters and celebrities. There’s one that says it hasn’t been used since John Kennedy was last there. What you can see inside has a great Cheese it! look. The classic post-WWII red barstools and gear left around suggests a panicked exit, followed by locking up…forever. Someone I know who casually knows the owners has a more plausible explanation. The property seems to be imprisoned in some probate hell. I couldn’t find any record through the county of 880 changing hands, at least since 1974 when the online records start. The probate court doesn’t do online, except for currently scheduled cases. Instead, this property attacts many interested potential revivifers. It seems they all get turned away. The property is not for sale. The owners responsible for the apartments say that the trust is not interested in selling. Oooo, the trust. I can’t prove it (let if know if you have solid info), but it smacks of a family dispute. I can see greedy relatives across two or three generations all sharing in the inheritance that includes 880. It would only take one who figured that this is worth a great fortune (fat chance!) and holding up any settlement or division in terror that he will somehow be swindled out of what is rightfully his. Meanwhile on Broadway, there’s a thriving haute Mexican joint, Tu Y Yo, a few doors away, a popular bike shop and around the triangular intersection several hopping restaurants. 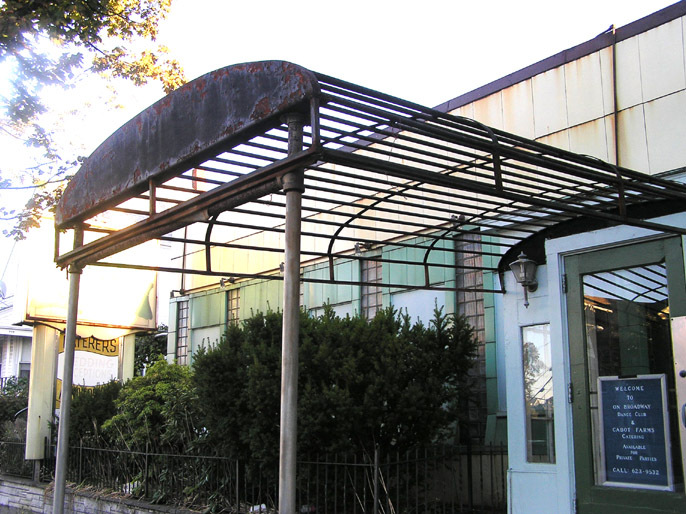 The ghost restaurant gathers dust, bidders and folklore. It’s always sunset at Cabot Farms. Boston is a city that likes its secrets and knows how to keep them. There’s no sense in letting the out-of-neighborhood folk know what street they’re on with signs! I’ve found yet another store that gets it, the Boston way. By found it, I mean in the French window-licking sense. I haven’t been able to get in after three visits during posted hours. The folk at the Syrian Grocery Importing Company on Shawmut Avenue in the South End are much crueler. They have a faded sign on their front door. It has very specific days and hours, for a schedule they don’t keep. The sked is flaky enough — Tuesday through Saturday, noon to 7 p.m. That looks like even a sloth or alcoholic should be able to do that. Double ha! I had been by a few times during hours, but the padlock was on the door. Today, I came prepared. I biked the five miles or so, bought a big coffee and settled in on the front stoop with a cryptic puzzle. That wasn’t a bad way to spend some time. I had arrived precisely at noon and was jolly. The window looked like a teenager’s desk drawer. It was piled and jumbled with all manner of treasures. When I wanted a stretch, I’d look. I saw one thing I was ready to buy immediately, a brass mortar and pestle for grinding saffron. I was a customer waiting to be relieved of money on my third trip. He added that he’d be by when they were open during the posted times, then long stretches when it was locked. For him, it was not an issue, there’s a goodly gap under the front door. That’s less effective in my circumstances. Now I know where places like the Eastern Lamejun Bakers in Belmont and Arax Market in Watertown are. I know too that they are quirky in that other way, the one of being open when they say. The city seems in on the grocery’s plot too. The way to 270 Shawmut is maze-like. You can’t legally turn onto Shawmut from the major east-west street, Berkeley. Then from Dedham Street, it is one-way the other way. If you want to get to it from Mass Ave or further South, you have to take Washington or Tremont and know which of two or three streets will let you into the secret road. Too soon or too late and Shawmut is one way the wrong way. I”m going to make it my business to get into that store just once, but no more special trips. There have to be real things I can do, like visiting friends in the South End or going to Chinatown. Even languor can’t defeat a determined shopper. My annoyance over in-traffic strollers has long morphed into amusement. My supposition, which some shrink friends say seems plausible, is that someone who saunters across an intersection or between two is acting out his or her powerlessness. They like to make the drivers and passengers wait for them because they feel like they aren’t in charge of their work and daily lives. Here is a chance to be in control over others. So it appears to be with too many flight attendants. The flood of news stories in recent years shows many acting out, perhaps for similar reasons as those amblers. Particularly since 9/11, what we and they themselves used to call flying waitresses have a new lawman persona. They kind of, sort of, a little bit are helping protect the airborne public from terrorists and other bad guys. While that is a good aim, it also gives the outliers in the group the excuse to play sham sheriff. Recently, it’s become absurd, as in the several cases of Southwest attendants enforcing unwritten dress codes on women with short skirts or what they arbitrarily decide is too obvious cleavage. Other less frivolous cases involve passengers pulled off planes and interrogated for seeming to attendants — sometimes egged on by other passengers — to be somehow threatening. Search in Dogpile, Yahoo or Google for terms like flight attendant and arrest to find such cases of (horrors) Arabs speaking Arabic, for example. I suppose we can’t expect attendants to show better judgment than the general flying public, or can we? One would think that if the airlines and government want to use attendants as a fourth or fifth line of defense, they would train them. Also, they’d need guidelines to keep them from overreaction or arbitrary judgments. With all of nervous about safety, particularly in the air, we don’t need to change the term flight attendants gone wild to man false arrest and harassment of passengers. “She meant well” or “He was just trying to keep the passengers safe” doesn’t cut it in these extreme cases. Attendants who clearly violate passengers’ rights need retraining or to face civil action or to explain themselves to the district attorney or at the least a dope slap. This nation has plenty of petty bureaucrats and self-appointed controllers of others’ lives. In places like the Registry of Motor Vehicles, they may just lengthen your wait while they play big shot. When they can trigger flight delays (and missed connections) for hundreds of passengers, and make poor saps they pick on go through elaborate, time-consuming, humiliating and stressful detention and questioning, they go too far. When a flight attendant loses it and causes a serious and unnecessary problem, we can’t hide them behind the only-following-orders shield. When they put on their shiny name tag, they shouldn’t be allowed to check their brains at the cabin door. The worst of the outliers are happy to hold passengers accountable for imagined transgressions. They need to know if they leave common sense behind, they’ll be accountable for their very real ones. Cross-post: This also appears at Marry in Massachusetts. After being J-hooked (see pic at left), I have biked to the offender’s window and asked what the devil he was thinking. Usually they speed away to my trailing curses, but twice I caught up to the offender. Both times, the driver has looked dumbly with an open mouth. Once he said nothing and the other time he said he thought he had lots of time to make the turn. Biking downtown and around, I am finding this more common than twits opening their doors into traffic without looking. That does happen and I literally always watch windows of parked cars before I get close (I hate heavily tinted windows). Even claim-a-lane guys like me have to learn lots of techniques for cycling amidst inattentive and even hostile Boston-area motorized-weapon drivers. J-hooking is a serious problem. It is plainly illegal and should, but rarely does, bring tickets or serious punishment, even when drivers maim or kill cyclists. Yes, it is reckless driving (and here the more serious driving to endanger when it involves injury), but we are left wondering what the drivers are thinking, if anything. We would very much like to get judges, prosecutors and cops on board to stop this madness. Crossposting: This also appears at Marry in Massachusetts…just because. You can meet and listen to some of the good guys next month at Moving Together 2007, the ped/bike/car conference. It’s for serious transportation geeks and includes policy and practice at the state and local level to encourage and maintain safety for walking and cycling. Plus, there are also very pleasant surprises from the new cycling advocate mayor in city hall. Judges and prosecutors seem to suffer from the there-but-for-fortune-go-I syndrome. In a personal example, an unregistered, uninsured driver turned left suddenly across three lanes and broadsided me on a bike. The Hyde Park cop investigating gave her a pass and did not notify me of her court appearance as required and agreed to. She was an unwed mother working at a downtown department store. Apparently because she was irresponsible in bed, she was also allowed to be irresponsible behind the wheel. She paid something like a hundred dollar fine. The other cop who handles such wrecks sort of apologized and said that was SOP there and throughout Boston. Most drivers look in front of their hoods instead of at the whole front and peripheral scene. That leads to tailgating, running into or in front of foot, bike and car traffic coming from the side. This may be the toughest because it requires a different way of thinking and a lot of brain power to process the flood of visual and aural data. Most of us just aren’t that bright and we can’t add more RAM to humans. Of course in sheer numbers motor vehicle operators are more dangerous to their peers and themselves. They kill each other by the tens of thousands annually. So you’d think that cops, DAs and judges would try to shift attitudes by prosecuting and punishing the reckless and inattentive to change the culture. Enforcement does not prevent crimes of impulse or passion like most murders, but sure punishment for drivers likely would. Instead, what we generally find is the attitude that it is too much trouble. Likewise the whole culture, particularly the mass media, terms inattentive and reckless driving that kills a cyclist as an accident rather than the irresponsible crime it is. That rhetoric is not melodramatic either. Many of us recall Douglas K. Richardson, whose killer walked. In 2002, the Beth Israel physician was biking the eight miles from Newton when he suffered an ignominious death by BFI garbage truck. The driver raced by and J-hooked him, and crushed Richardson. The Brookline DA actively prosecuted but the case went no place in court. In contrast, this week’s death of a 13-year-old girl cyclist in Walpole has brought charges. From the reports, this looks like another J-hooking. The NStar truck driver wasn’t wearing his corrective lenses as required. We know that seventh grader Justin Trainor was riding legally on the right side and place when he drove by her, turned and rode over her, dragging her and her bike. My cynicism suggests that he may do a short prison sentence, pay a fine and lose his commercial license because of the circumstances. The victim was a young girl, not a 30-year-old tattooed messenger. This was suburban. They don’t cotton much to murdering their kids. One such prosecution is the right thing to do. Particularly because the penalties remain light, less than other types of homicide and less than pot sales, consistency is key here. Drivers need to be aware that killing cyclists will surely mean loss of license, high fines, a huge jump in insurance premiums, and maybe jail time. Nothing else would make for the necessary alertness and attentiveness. My potential Steve Irwin moment never happened. 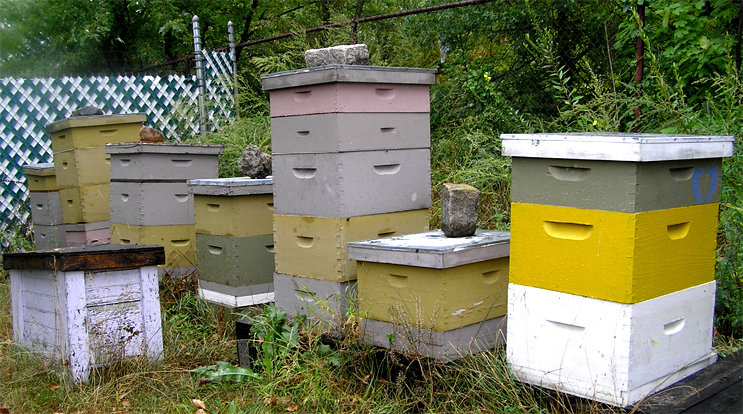 The incessant drizzle and low 60s air kept all but a few brave girl bees in the Mattapan hives today. As part of the Boston Natural Areas Network Fall Harvest Festival & Perennial Divide, I had been promised a chance to wear the goofy hat and netting, with instructions on handling the bees and frames with honey. Crikey! Instead, I know quite a bit more about urban beekeeping. My tutor was Mike Graney, who lives just a few blocks from me at the very bottom of Jamaica Plain. He keeps a local hive of what he calls his pets, little furry pets. His heavy-duty honey factory is down at the bottom of Mattapan on the Neponset River. Actually, there was another beekeeper there, but I didn’t meet Judy Lierberman until I was on the way out. She just started and keeps her bees at the Brookwood Community Farm in the Blue Hills. I bike by all the time and she said I need to stop and see what they’re up to. Just when Allendale Farm would have you believe they are the only game in town, Milton is dueling with Brookline for the bucolic title. Meanwhile, Mike’s my guy. He lives a few blocks away and keeps a hive in the Forest Hills area of JP. Actually, for those of us who think that rural is a walk in the Public Garden, we need to be aware that cartoon and historic give that looks sort of like a point Bib the Michelin man is not what modern apiarists use. There’s a local-ish connection to that too. In 1852 an Andover minister, Lorenzo L. Langstroth, developed the frame system that slides grids into slots in wooden boxes. The bees leave their honey and they create the nooks for the larvae the queen lays. The hive systems look like those below in the Mattapan gardens. Mike owns most of those, but all are pretty much the same, stacked boxes (called supers) where the bees live, breed and make honey. The bees are free to come and go, as in the picture at the top. Bees don’t like being out and about in cool or wet weather, both of which it was Saturday. A few flew, but not enough to open the hives for giggles, even to please somene eager to put on the netting. He knows plenty though, including how honey changes seasonally, week to week. He can smell and taste the differences, starting with the sweeter, lighter spring honey bees make with nectar from fruit blossoms. It changes with the April rains and again around Mother’s day, when the spring flowers produce “a light, pale, delicate honey”. He pointed to some of the garden’s aging annual flowers that September afternoon. “Later the blooms tighten up,” he said, which leads to darker, more powerfully flavored honey. Inside a frame, the bees seal (cap off) the current honey. “This really is much like a snapshot of what they bring back, a time capsule of what was blooming,” Mike says. He says like a vertical beer tasting, comparing honeys from the same place or distant ones is a real pleasure. He collects jars from his travels and will pick up and taste unusual ones from places like Italy as a novelty. Personally though, he likes his pets’ output. “I don’t care for the clover, hay or bulk honey from the Midwest,” he says. He finds those bland and without complexity or variety. On a note that may seem yucky to some, bees partially digest the nectar to make honey. In effect, they take the runny flower nectar and extract the water, outputting the good stuff back in the frame at home. Ideally, they’ll cap off the honey with 15% water. Any more will mildly ferment the honey, which makes the bees who consume it sick. Local plug: If you just have to try Mike’s bees’ output, you can pick it jars locally, including at Gadgets, Centre Street, JP, yards south of JP Licks. For his own hives, he faces the same die-off situation all beekeepers do. Last year, for example, he lost three of his nine hives’ residents. This is not the same situation as in the widely publicized situation for large commercial apiarists. Those businesses have hundreds or thousands of hives. Many of them migrate with crops for six months a year, stopping to rent them to fruit and vegetable growers from Florida to Maine, and returning to their home base. 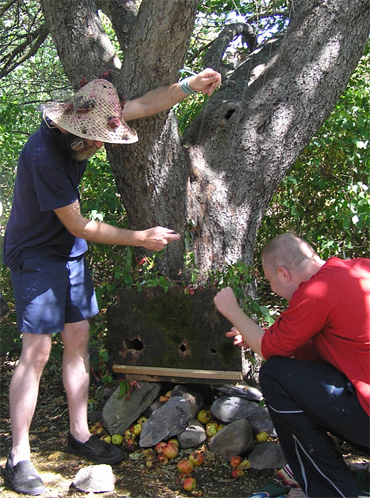 For these guys, honey is “almost a waste product,” Mike says. They’ll keep enough in the hives to give the workers and queen food, particularly for winter, but many don’t care much whether they sell any. Their business is renting pollinators. Sometimes this can lead to staggering numbers. Although he has not visited when the trucks finish their year in the blueberry barrens of Maine, he says they have up to 30,000 hives Downeast before the trucks return to home base. That sight might be worth a road trip. Mike’s been at this for several years, starting with one hive and now up to nine. The bulk of his commercial honey output comes from the Mattapan towers. He’s not as cold a capitalist as the pollinator renters, but he has gotten used to his annual losses. Non-carnivorous bees are much less likely to sting a human than wasps and hornets. Yet, despite his calling bees his pets, Mike knows that 20% or more of his colonies will die annually. The pollinator truck guys lose much more and their losses are the basis for the current articles. Mike notes that some other local apiarists scoff at the stories and say that they lose a third every year and have for decades, with no media coverage. The bulk of the problem seems to be from two varieties of mites that infest a hive and weaken the bees so that they do not produce enough honey and become asthenic from blood loss. While you can’t exactly go to Stop & Shop to replace bees, they are sold by the pound. When Mike loses a hive, he orders a 3-pound box for $75 with a queen, cleans out the old supers and restocks. For the majority of colonies that live, he leaves them with about 50 pounds of honey each for the winter. They kind of hang around in cold weather when many bees die of old age, but most are ready come the spring warmth. Maybe I’m too much of a city kid, but I wondered about security. Down in Mattapan Square, largely hidden from sight at night, you’d think that hives might be a target from kids with too much time. Mike says that isn’t a problem. Not only are the gardens enclosed in a chain link fence and padlock, he notes that the joves are pretty plain boxes. Most people don’t know what they are. Besides, messing with thousands of bees at a time doesn’t seem like a good idea. I need more info, quotes and pix to finish an urban beekeeper tale. All should fall into place this Saturday in Mattapan Square. There shall be vegetables, gardens, master gardeners, bee hives, music, a plant swap and like that, sweetheart. 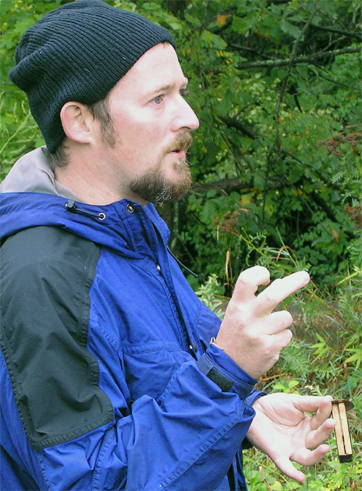 The Boston Natural Areas Network hoosts its annual Fall Harvest Festival & Perennial Divide. 30 Edgewater Drive, Mattapan Square. My local beekeeper, Mike Graney, has his production hives there. He claims those in my immediate neighborhood are his pets. But the hundreds of pounds of honey he sells annually come from the set of hives down on the Neponset River. He says that the hosts will have the hats and netting for those of us who just have to handle the honey makers and their comb frames. This event is free, but you only have four hours, slugs. Get with it. FREE PLANT SWAP: Gardeners are invited to exchange, donate or simply take home perennial divisions and other plants. (Please pre-divide plants into smaller pieces and bring containers to take your plants home.) Master Urban Gardeners will be available to give advice on plant care. PLANTS FOR SALE: Select native plants propagated at City Native Nursery will be available for purchase. ACTIVITIES FOR CHILDREN & YOUTH: Enjoy a special children’s activity. MUSIC: Live music by Two for the Show. MARKET PRODUCTS: Take advantage of the gardeners market of honey, fresh produce, baked goods and other products produced by community gardens to help support their gardens. INCREDIBLE CROP OLYMPICS: To enter, bring your crop to the judges’ table at the Festival. You can enter more than one category, but entries must be at the judges’ table before 12:00 p.m. Winners will be announced at 1:00 p.m. Contest categories: Biggest Tomato (circumference measured in inches). Heaviest Zucchini (weight measured in pounds and ounces). Largest Sunflower (diameter measured in inches). Most Voluminous Vegetable (circumference measured in inches). This is madness…no, this is urban gardening. Let’s consider it an itinerate preview for JP Open Studios. We dragooned visiting friends to gawk at, poke and snap work at temporary ateliers on Bumpkin Island in Boston Harbor. There was a lot of ho-hum work at the Art Encampment. Then again, who can fairly criticize the spontaneous and make-do works created with found objects and a few imports? 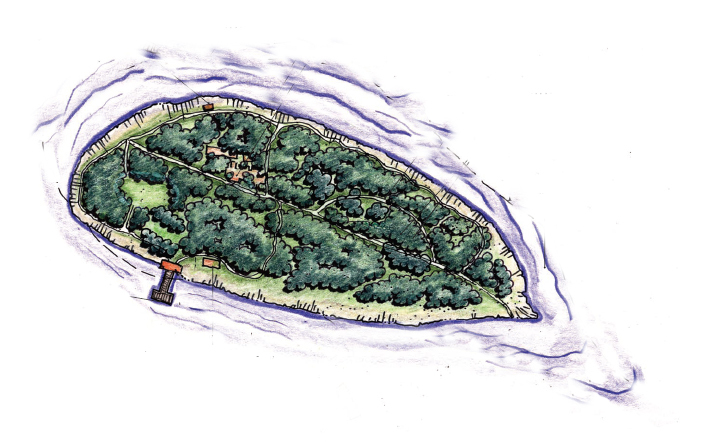 The gist of the project is several clumps of artists spending three days on the island as homsteaders. They could bring one backpack of mainland stuff, like paints or wires. Everything else had to be local. (Allegedly and according to the parks rules, no alcohol or other drugs were allowed. Build some kind of “home” on their plot of land. “Improve” the land in some way. Our chums are from the northwestern corner of Connecticut. In Salisbury, there is much aht for and by the wealthy weekenders (many Republicans from Manhattan), but most of it does not include mangled starfish nor rusty cans from the beach. Instead, it is often the maple or birch dominated landscapes, as common as the sea grass and gull works we see on this side of New England. For better and worse, that’s not what the encampment was doing. Those who wanted artiste and Reader’s Digest level visual comfort should have stayed on the dock or on their hotel patio. There’s intriguing stuff, much of which seems to have benefitted from a lot of planning and preparation. 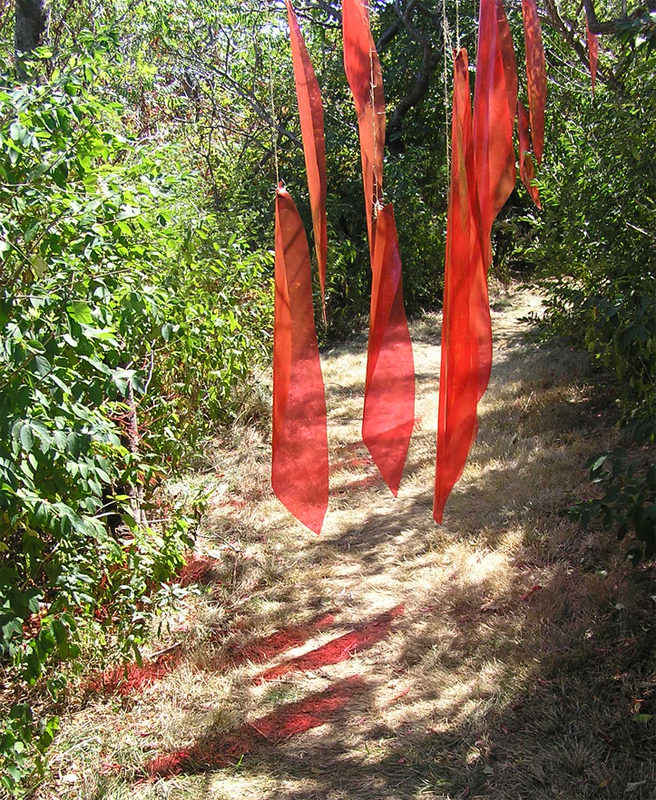 For example, a bend in one path revealed a curtain of suspended leaves of transparent orange plastic. The sunlight passing through created images of the leaves on the ground, on vegetation and on passersby. It was an impressive blend of the natural and manufactured, but almost certainly not a spontaneous work. This was a crowd favorite. It shared the long, arcing path with numerous other works. Some were obvious, others tuned the eye and played mind tricks. Think of leaving a visually powerful movie, any David Lynch one or a Lord of the Rings flick. You see strange critters and curious folk everywhere. We were trotting along when suddenly one of our group would notice a piece first, an art object that others had passed. For example, there would be a small sheaf of dried grass tied and handing horizontally about seven feet off the trail, but still obvious to the alert eye. In another spot, an eye-level work strung a series of shells from a tree limb. 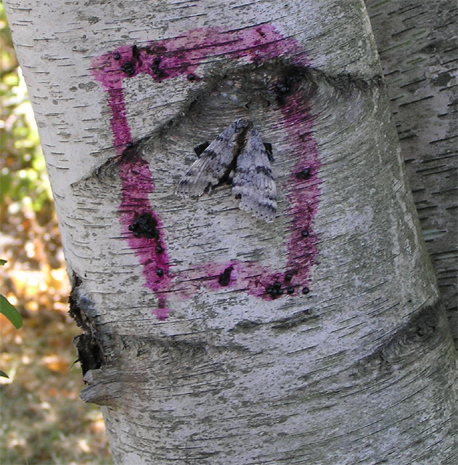 In yet another spot, a white birch sported a lavender marker frame of a moth. The insect had similar tones and colors to the bark. It stood out only by the contrast of the frame. A careful look behind revealed that black electrician’s tape held it to the tree. At the head of one trail, two artists (like Lone Ranger, they were gone when I turned to asked their names) worked on Cricket. This one struck the fancy of the teens, boys and girls, in the group. Its upper portion had a head of a horseshoe crab shell. 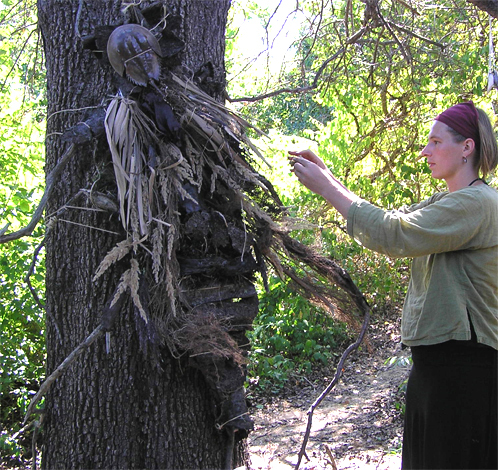 The body was of densely attached twigs, grasses, bark and other natural cast-offs found on the ground and around. A part of the joke seemed to be that like a cricket, everything was from the ground. Nearly all its components were like molted shell as well, leavings of the larger beings. That reads impressively. We saved that for the last. One of us plays the upright bass and perhaps we had our hopes up a bit high for that as a capstone. It was as advertised, sort of. Wires traced a bifurcated tree trunk up over six feet. They attached to a small box at the bottom with holes. Two or more plunkers could play it simultaneously. Yet jaded Bostonians and Nutmeg types that we are, we longed for musicality. After three days of camping, creating and being one with nature, they had failed to give it anything like the lusty growl that characterizes a double bass. You could produce an infinite number of whiny twangs, but not a single resounding strum. I fear the failure was in the audience. We failed to apprciate the bass. Amusingly, the schedules for the ferries seemed to discourage gallery browsing. On Sunday, the 10:30 shuttle from Georges simply didn’t dock or run. Those waiting got artsy orange exes on the backs of our hands. That meant that we had dibs on the 12:30 ferry, which took about 40 folk, which in turn meant the 12:30 people got their orange circles and bumped the next set of encampment-viewing hopefuls. Once there, you could wander for an hour and a half or three and one half hours. The last shuttle returned at 3:45. That lead to a lot of quick paced viewing. Fortunately, this was not an MFA special where you were like ground meat forced into a sausage casing shuffling behind others with their audio tours telling them what to perceive. On Bumpkin, you were on your own, with occasional interactions with the artists. There was no subway outside or café inside, but you could touch and examine the art in depth and at leisure with no rent-a-guard looming. Many of the artists are known for their other public works, like the cows in Somerville. I for one hope that the Harbor Island folk leave the work, perhaps checking on it and doing what has to be done in the spring. That would provide the flavor of art in the everyday so often lacking here and evident in places such as Santa Fe. Here, you would do well to walk the grounds of the Forest Hills Cemetery to see how this works. There, the sculpture path provides the visual surprises all year. Of course, those works were meant for outdoor permanence and not made in a transient rush as the encampment. Combining such efforts in public spaces would not be a bad idea. You are currently browsing the Harrumph! blog archives for September, 2007.